Singer/Songwriter/Dancer/ Entertainer Djoir Jordan may be the freshest artist to hit the EDM/pop/rock music scene in a while. Her edgy style and fun catchy lyrics driven by hard hitting sounds will keep you captured and excited, leaving you wanting more. Djoir has worked with huge named acts such as; LMFAO, Dalvin Degrate and KC of JODECI, Ginuwine, Jason Edmonds, Chuck Cymone, NOVASPACE, Shaneal Funk, Breanna Kennedy and many more. 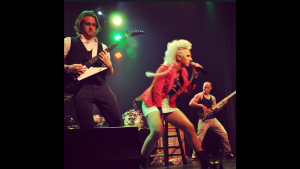 Djoir Jordan‘s single “Get This Party Rockin” (Feat HP) was recently placed in the upcoming movie trailer for Best Night Ever that will hit theaters January 2014. Her 1st single release with NOVASPACE called “Control” (Feat. Djoir Jordan) quickly climbed to #62 on Beatport’s Electro House chart and has gained support from Top EDM artists like the infamous Lazy Rich, Cold Blank, Dirty Loud, Ryan Enzed, and number 1 australian DJ TyDi. Her 2nd release with NOVASPACE called “Right Now” (Feat Djoir Jordan) climbed to #13 on the UK charts and gained support from Knife Party, Gold Top and many more Djs around the world. Djoir Jordan is no stranger to performing live in front of large crowds and big stages. She’s opened for many multi platinum selling artist, and most recently did an AFE (Armed forces Entertainment) tour in Japan where she performed for the military troops and their families, She’s toured all over Southern California and the US with hopes of touring more within both the US and internationally. 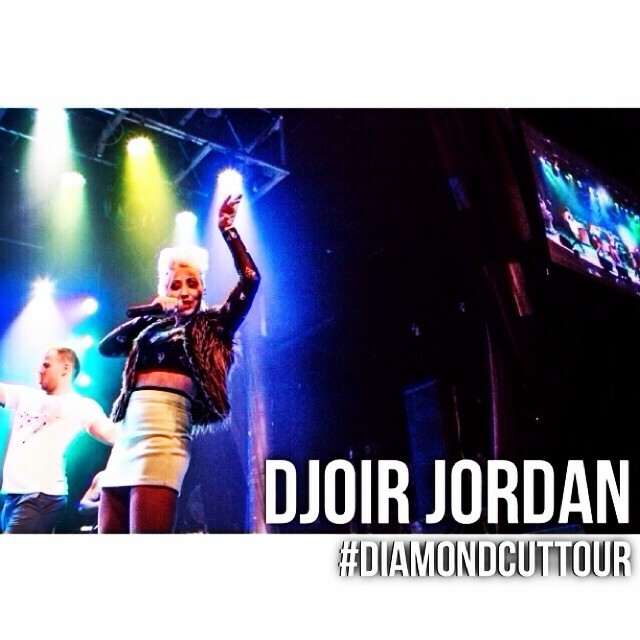 It’s safe to say that her high energy shows are quickly becoming crowd favorites and Djoir Jordan is not a name that you will want to ignore. 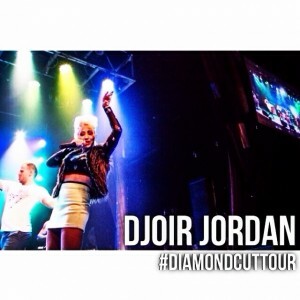 All Access Music Group writer, Nicole DeRosa recently got to chat with Djoir on what it means to be “Diamond Cut”, tour life, and more! My music is very high energy, with a positive message, fun catchy lyrics driven by hard-hitting sounds. What is that Djoir Jordan style? My style is a very unique blend of Pop/Dance music garnished with the edginess of rock. My guitarist and bassist come from a heavy metal background so blending it with Pop makes for a very unique sound. I always try to “burn the box”, that way I am never limited to who and what I can be in today’s industry. When and why did you start writing and performing music? My love for music started at a very young age. When I was 3 years old, I started singing on stage at my grandmother’s church and totally fell in love with everything to do with music. As I started to get older, I’d hear melodies and lyrics in my head. At the time, I still was too young to really understand what song structure was, so I would just turn on a tape recorder and start recording my random ideas. Funny thing is, I still do a lot of my writing like that today and use my iPhone to memo the different ideas that pop into my head. As far as why? Because I knew I wanted to reflect my light to the world and really impact people with the talents I’ve been given. There is no better feeling than to take people away from whatever it is they are going through and shine your light into their lives. Even if it’s only for a brief moment, I feel I have done my job as an artist. What are your fondest musical memories? When I was probably about 5, my mom and I went to this random fair and somehow made our way into this HUGE concert… Well, maybe it just felt so huge because I was so small! Anyway, my mom snuck me in to see the singer perform and all I remember was seeing a sea of lighters in the air. I was in total awe of how much this one person impacted the entire room. My eyes were locked and I began soaking in every move she was doing and every note she sang. I loved the lights, the clothes and the music. I just couldn’t get enough! From that moment, I was literally hooked. The energy that filled the stadium was unreal. I knew I wanted to be a performer. I know you have been fortunate to go on to tour in Asia & Europe. Tell me more about how that came about. I was asked to do an AFE (Arms Forces Entertainment) tour to perform for the troops and their families that were stationed all over Japan. I did 9 shows all across Japan in less than 2 weeks. It was such a cool experience to travel around in such beautiful country and give back to the people that fight for our freedom everyday. I was so humbled by their love and support and hope to do another tour again soon. There are so many different ways the process can develop. Sometimes it’s an idea or life experience that inspires me to pick up a pen. Other times, I will hear different melodies in my head, which leads to finding the right words to put in place. I also love sitting down with a guitar and working with other talented musicians and songwriters. There is something special about bouncing different ideas off of someone that can lead to something so magical. Other times I get instrumentals from producers and I write around that. There is literally no repeatable recipe for writing a song. It’s all just how you get inspired in the moment. 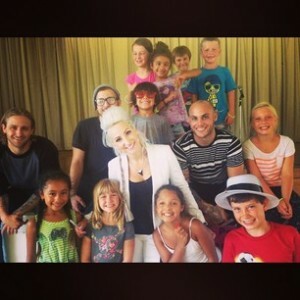 Djoir and her band recently performed on the Power Of A Dream Tour, which also helps to inspire kids to fulfill their dreams. There are 4 of you in the band. Do you always get along? How did you all first meet? Yes, we all get along really well! We are so silly and can joke around like family. It feels like we’ve all known each other for a lot longer than we have. Our personalities really balance each other out so it makes for a unique vibe between us. I am so thankful to have that closeness with such talented musicians involved with this project. Here’s how we met… I originally put out an ad for a drummer and guitar player. After getting a response from Sean, we decided to meet up at Howl at the Moon (Universal CityWalk) where I put him on the spot (and the stage) to see what he was all about. He totally killed it and Sean Kreisburg was the first person I added on for Drums. From there we began to look for a guitar player that would complement the Diamond Cut team. After a few unsuccessful attempts to find someone with same vision and work ethic, we finally discovered and added Nick Arnold (aka: Nick A) as our guitar player. His background is metal and had recently been in a band that was kind of in a stand still. He asked if I needed a bass player because his long time friend and band mate Nick Boger (aka: Nick B) was looking to get involved with something new. After Nick B auditioned, it was clear he was also a perfect fit for the Diamond Cut team. Besides the band, the Diamond Cut Team is more than just the four of us. We have 2-4 dancers depending on the show, and many other people that dedicate their time to help with the project. I want to make sure I include everyone because I am only as strong as my team and I am so fortunate to have people believing in this project. You just do! LOL! Simple as that! Not much sleep, lots of coffee and patience. I wake up early and go to sleep late. If I’m not grinding between obligations, I’m letting my “competition” get ahead of me. I always say, “If you’re not the one working the hardest, you’re the one left behind”. This is a business and I treat it that way. One of the most challenging parts is balancing everyone’s schedules. I am fortunate enough that the majority of my personal relationships understand what I am doing and support me whole-heartedly. What is the hardest and best part about being in an unsigned band now? Best part is having the freedom to make the choices I believe in with my team. Never setting a limitation of what the project can become and working with all kinds of people. I love being as versatile as possible. I also love being able to play any venue, any time and have those intimate moments while building my fan base. Those connections are priceless. The hardest part is supporting this project without a manager, label or investor. I’ve had people interested in coming on board the Diamond Cut Team; however, I want to make sure everyone that is involved in the project truly aligns with the vision and the brand I’ve been building. For the last year, I’ve been wearing a lot of hats, which is great, because I have learned a lot about how to manage the big things as well as the little things. It will be nice once I find the right people to take over some of the responsibilities and I can pick and choose what I take on. Djoir recently performing at The Canyon Club opening up for Aaron Carter. Your motto is “Be Diamond Cut”. Can you explain what that means to our readers and the idea behind it. My birthstone is a Diamond. I feel like my calling in life is to be a light to the world through my music and to “Be Diamond Cut”. To Be Diamond Cut means to be unique, stand out and reflect your light into the world. Everyone is uniquely made with so many special qualities that sometimes we forget that it’s ok to stand out like that. It symbolizes being yourself and loving who you are and loving what you do so you can bring happiness into other people’s lives. If we stop focusing on everything that is wrong with us and start appreciating what we have and love our “true self” as well as others, that message can be powerful enough to change the world. Who are your major influences as a performer, and singer songwriter? That’s a tough one… I have so many influences that it’s hard to narrow it down because I am a fan of all genres and there are pieces that I take from each one. Performance wise I’d say, Michael Jackson, Madonna Gwen Stefani and Pink. Vocally I’ve always loved Brian McKnight, Christina Aguilera and Stevie Wonder. All around, The Rolling Stones, The Beatles and Prince are also huge influences. See, I always listened to the radio growing up so it was always a mixture of so many different styles. I truly believe that is why I am so versatile today. Do you get nervous before a performance? How do you handle that? Oh yes, I always get nervous! It’s a lot of pressure to make sure the show runs smoothly. I always have a panic moment like “OMG, I can’t remember my lyrics!…” then of course I take a second to breath and everything kicks in because we’ve rehearsed countless hours on this. It’s also important to take a moment with my team to remember why we are performing, having gratitude to the talents we’ve been given and to shine our lights into these peoples lives. That usually gets me ready to hit the stage. Where can we see you perform? Upcoming shows? What can fans expect to see at your shows? You can expect a high energy, party like atmosphere, dancing, catchy lyrics, costume changes, live music, live vocals, dramatic visuals, and I even incorporate my gymnastics background. Everything else is a surprise, so you’ll have to see it for yourself!